Temptation galaxy s8 case by Elisheva Nesis. Protect your Galaxy S8 with an impact-resistant, slim-profile, hard-shell case. The image is printed directly onto the case and wrapped around the edges for a beautiful presentation. Simply snap the case onto your Galaxy S8 for instant protection and direct access to all of the phone's features! CONGRATULATIONS!! Featured on Women Painters. Great artwork. Love the colours, textures and composition!!!! Thank you again, dear Madalena! Love this! Featured on Exclusively Drawings and paintings! The sides are painted so you don't need to frame it, but can if you like. ------------- Certificate of authenticity included. ---------------- The series of original paintings CATS and ANGELS of JERUSALEM is dedicated to the cooperation of the cats, the most mystic animals on the Earth, with the angels, heavenly creatures, the nearest to us. 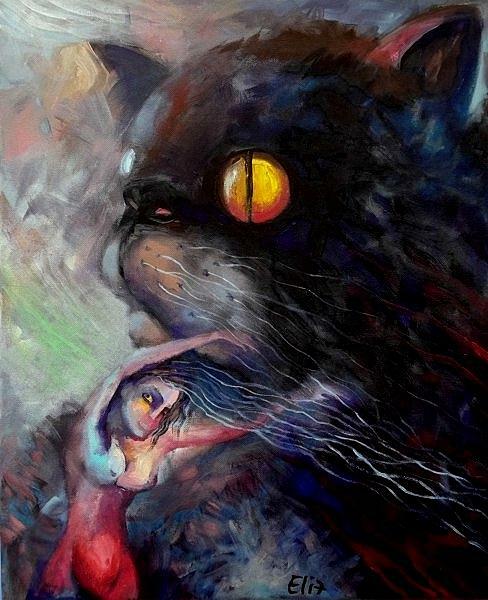 Everybody can find angel and cat inside him.----------------- You can order the artwork print on canvas. Additional 2" at each side to make the print suitable for stretching and framing. The print is signed and numbered by the artist.